On a former colonial plantation, this 256-acre property is 3 miles from Colonial Williamsburg and 12 miles from Busch Gardens. 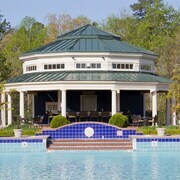 Situated on what was once a colonial plantation, this resort is 5 miles from Colonial Williamsburg and 7 miles from Jamestown. Clean, comfortable, convenient. Check in was efficient, but less than friendly. Where to find Williamsburg hotels near an airport? Where can I find hotels in Williamsburg that are near tourist attractions? 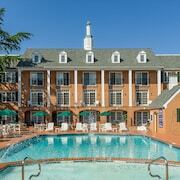 Visitors to Coastal Virginia are spoiled for choice when it comes to finding quality hotels in Williamsburg. If you are looking to stay within 0.1 kilometres (0.06 miles) of downtown Williamsburg, Expedia's up-to-date database lists no less than 81 places to stay that match that criteria. If you are seeking accommodation within 3 kilometres (2 miles) from the Williamsburg city center, Williamsburg Manor B&B and Wyndham Governor's Green are perfect. The Water Country USA and the Governor's Palace are well-known Williamsburg, attractions and many visitors choose to stay nearby. The Parkside Williamsburg Resort and the King's Creek Plantation are closest to the Water Country USA and the Williamsburg Lodge - A Colonial Williamsburg Hotel and Cedars of Williamsburg Bed & Breakfast are close to the Governor's Palace. If you are budget aware and are simply looking for the best priced Williamsburg hotels, you'll find that there are affordable hotels to choose from in the vicinity. 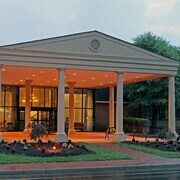 The DoubleTree by Hilton Williamsburg is 9 kilometres (6 miles) from the heart of Williamsburg, while the Fairfield Inn & Suites by Marriott Williamsburg is 2 kilometres (1 mile) away. Two other Williamsburg hotels in the lower price range include the Holiday Inn Express Williamsburg North and the Country Inn & Suites By Carlson Williamsburg Historic Area. 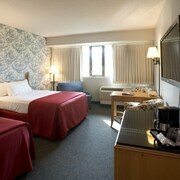 The Great Wolf Lodge Williamsburg is positioned 6 kilometres (4 miles) from the heart of Williamsburg. 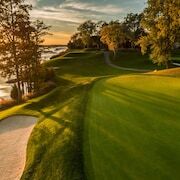 Another option is the Kingsmill Resort, which is located 11 kilometres (7 miles) away. The Colonial Gardens Bed & Breakfast as well as the Wedmore Place are some other Expedia-listed accommodation options in Williamsburg. If time allows, you could explore more of the Coastal Virginia region. Coastal Virginia offers beaches and coastal plains. 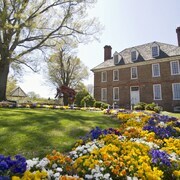 Commonly visited Coastal Virginia tourist destinations are history museums and open-air museums. In this region of United States of America tourists might also enjoy hiking, horse riding and quad biking. Norfolk - Virginia Beach is 70 kilometres (44 miles) to the southeast of Williamsburg and is where you'll find Chrysler Museum of Art and Norfolk Botanical Garden. Some of our recommended Norfolk - Virginia Beach accommodation options include the Homewood Suites by Hilton Virginia Beach/Norfolk Airport and Residence Inn by Marriott Norfolk Airport. Alternatively, you could consider staying at Hampton, 45 kilometres (29 miles) to the southeast of Williamsburg, where you can choose from the Embassy Suites Hampton Roads- Hotel, Spa & Convention Center and Courtyard by Marriott Hampton. The Virginia Air and Space Center and Hampton University are just a couple of the more popular places to experience should you visit Hampton. If you are flying into or out of Newport News - Williamsburg International Airport and plan to stay nearby try Staybridge Suites Yorktown or TownePlace Suites by Marriott Newport News Yorktown. What are the most popular Williamsburg hotels? Are there hotels in other cities near Williamsburg? What other types of accommodations are available in Williamsburg? Explore Williamsburg with Expedia.ca’s Travel Guides to find the best flights, cars, holiday packages and more!